Derrick Rhone-Dunn, Wayne Elliott, Lance Easley: Here's everything we know about the refs who botched the Packers-Seahawks game. Derrick Rhone-Dunn, Wayne Elliott, Lance Easley: Here’s everything we know about the refs who botched the Packers-Seahawks game. 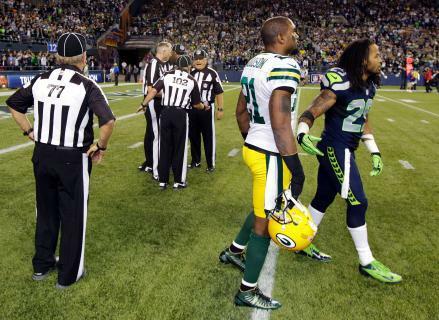 The Packers-Seahawks refs: Who are those guys? Officials discuss the final play of the game as Green Bay Packers’ Charles Woodson, second from right, and Seattle Seahawks’ Earl Thomas, right, leave the field. This, to me, is the iconic photo of last night. More so even than the side judge signaling touchdown while the back judge waves his hands over his head. As the video booth checks the replay, the officiating crew gathers for what looks like a heated discussion. An argument, you might even say. The field judge (102) jaws with the line judge (59, number partially visible). The two officials who actually made the call are silent. The head linesman stands away from the huddle. The referee is nowhere to be seen. Perhaps the most remarkable thing about these replacement officials, be they formerly amateur, arena, or lingerie, is how little we know about them. In the old days, refereeing assignments would be announced a few days before the weekend—just another page in the media packet. But now that everybody wants to talk about the refs, and learn their backstories, the NFL has made that information a lot harder to come by. Why does it matter? Accountability. For all their mistakes in the first two weeks, we have no idea if the NFL has been punishing those officials by reassigning them or releasing them. We have no idea if the NFL cares when these guys screw up, or are even paying attention. And, of course, there’s the fact that outcomes worth hundreds of millions of dollars are being overseen by officials with less-than-comforting backgrounds. Rhone-Dunn, the back judge who had the best view of the play and initially signaled interception, is the most experienced member of the crew. Formerly a Big 12 official, he worked the Sugar Bowl back in 2007 and arena games since then. Easley, the side judge who overruled Rhone-Dunn, is a banker from California, who has officiated high school and junior college games, both football and basketball. Elliott, the head referee who should have gotten his crew together and asked them what they saw before signaling for a touchdown, is a real estate agent in Texas who has worked high school, college, and indoor football. Will this crew be disciplined? Broken up? Sent to re-education camp to watch film, or docked salary, or let go altogether? We might never know. Because the NFL wants you to put your trust in it—even after a huge Saints fan was assigned to work a Saints game, and an official who drew paychecks from the Seahawks for three years worked a Seahawks game. I know what’s best for the league, Roger Goodell whispers. Forget those silly questions about the refs, and while you’re at it, forget about asking what the actual Bountygate evidence is, or what the league is doing about brain trauma. Trust the NFL.